Hibiscus are known for their huge blooms that come in almost any color! There are also many different types of these plants. At The Garden Center, you can find both tropical and perennial plants. 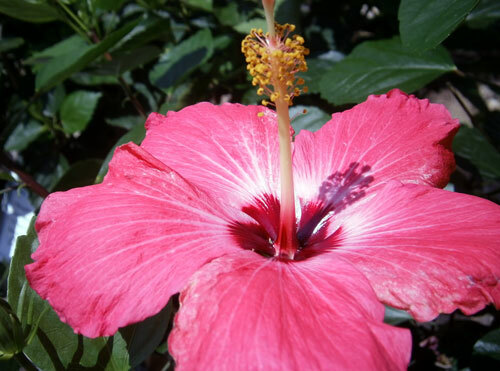 Tropical Hibiscus have are tropical evergreen plants with thick, glossy leaves and large flowers. Not only do their flowers come in a rainbow of colors, they can have frilly edges or even double petaled! They make a great hedge growing to about 4-6' tall and wide. They can be easily sheared or even trained into small trees. Tropical Hibiscus are somewhat tender here in San Antonio and will need protection from hard frost in the winter. Try planting them near your home away from the north wind. They are also great in containers! One way to avoid the hardiness problem is to choose a perennial Hibiscus instead. Also called Mallow or Hardy Hibiscus, these will die back each winter, but return in the spring. Their leaves are a little thinner, a lighter green and can be anything from heart-shaped to thin and serrated. Some varieties have flowers as big as dinner plates! They will grow about 4-6' tall and wide with a more open growth habit than its tropical cousin. They look great when planted behind other perennials. 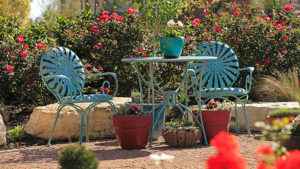 Whichever type of type you choose, they are sure to add beautiful, show stopping color to your landscape. Oh, by the way, both types tolerate our Texas heat!